When engaging in routine house cleaning, the last place we often think about is the garage. Despite storing our dirty gardening tools, muddy boots and shoes in the garage, and driving on its floors, we tend to overlook it when it comes to cleaning. Experts at Pete’s Professional Painting & Power Washing can add life to your garage floors. Our professionals are extensively trained and experienced in handling the floors in garages. They use their skills to efficiently work on your garage floor coating project. Garages are versatile spaces we don’t just use to store cars and tools, but we also let our kids use it to rock out or run experiments. Even despite this fact, garage floors are always overlooked. What’s more, very few people even bother to make their garages look attractive. You might think that the effort and money that would go into such a project would be a waste with no good returns. But you are wrong. 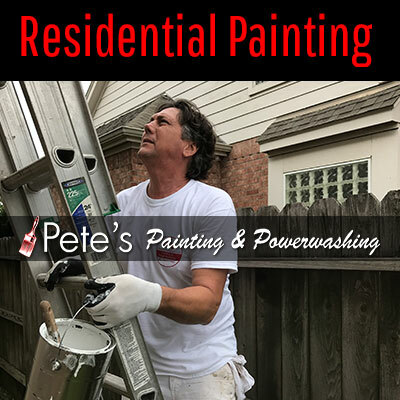 Pete’s Professional Painting & Power Washing has professionals who can convert your dilapidated garage into a functional, safe and beautiful haven in your home. Epoxy Coatings are available in acrylic flakes and various colors. They have chemical resistant properties atop being the most cost-effective floor coatings. Polyaspartic Coatings are also chemical resistant. Available in various colors and finishes, these coatings are durable and dry fast. Moreover, our professionals can customize them to suit your chosen style. Sealing your concrete garage floors can ease cleaning hard-to-clean oil spills. You also get a new and clean finish on your garage floor, in addition to protecting it from concrete damages that might occur in the future. Pete’s Professional Painting & Power Washing can help you upgrade your garage for an enhanced look or simply to improve the value of your home for a better selling price. Contact us for a free price estimate and to schedule an assessment of your garage floor.